Be the first to share your favorite memory, photo or story of Tayven. This memorial page is dedicated for family, friends and future generations to celebrate the life of their loved one. 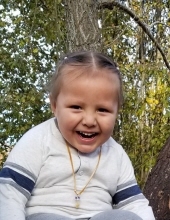 On Thanksgiving Day, after having spent a glorious day surrounded by his loving family, Tayven Alexander Nataye Pappan, White Buffalo Walking, was called home by the Creator to dance among the stars. He was 3 years, 4 months and 10 days old. Dighton Marler Funeral Home of Stillwater has been entrusted with arrangements. Tayven was born in Ponca City on July 12, 2015 to his mommy Casey Horinek and his daddy Triston Pappan, and we all instantly fell in love with our baby giant. He was as bright as the light of a shooting star, walking early, talking early, and spreading joy with his infectious smile and vivid imagination. Tayven was a true blessing, and has a huge family that is devastated by his loss. He was blessed with an amazing Mommy and Daddy and beloved and cherished by all. Tayven attended the Otoe-Missouria Daycare from the age of 6 weeks old, and then had his first day of school at the Otoe-Missouria Head Start in August. He had a lot of friends, and wonderful teachers who cared for him Tayven loved to spend nights with his Gamma Julie and his best friend and Auntie DiDi and his Uncle Louis, and loved to play at his “Aunties” house with his Lola, Zaby, Grey and Jace, but his favorite thing was to be with his Mommy and Daddy, watching Paw Paw Patrol, Blaze and Ninja Turtles, all snuggled up and loved. Tayven is survived by his Mommy and Daddy, his Gamma Julie Horinek, his best friend and Auntie Diane, his beloved Uncles Louis and Devin, His GG and Great Papa Casey and Mike Horinek, His Grandma Milly Pappan, his Uncle Nemaceo Molina, his Auntie Jailen Higine, his loving Uncles Javier and Angel Higine, his baby Uncle Isaias Rios, his Great Grandma Noreen Pappan, his Grandpa David Martin, his special Aunties Jewell, MatheAnna and Serena, and numerous Grandpas and Grandmas, Aunties and Uncles, cousins, and fellow Great Grand Babies. Services for Tayven will be held at the Cultural Building in White Eagle on Monday, November 26th, and a traditional funeral will be held on Tuesday, November 27, 2018. Tayven’s Grandpa Mekasi Horinek is in charge of services, his Grandpa Jeff Horinek is in charge of the burial and his Auntie/Grandma Suzaatah is in charge of Arrangements. Tayven will be laid to rest on the property of his Great Grandparents, where he will never be alone, eternally surrounded by his loving family. Pallbearers will be his special Uncles Eli and Branden Horinek, Louis Faw Faw and Jeremy Williams. Honorary Pallbearers are Isaac Williams, Preston Williams, Namaceo Molina, Angel and Javier Higine. The outpouring of love, prayer and support has sustained us through the most difficult time of our lives and we ask that you keep our family in prayer, especially his Mommy and Daddy. “I will love the light for it shows me the way, yet I will endure the darkness for it shows me the stars” One day we will be reunited with our cherished baby, and dance among the stars with our Ancestors. To send flowers or a remembrance gift to the family of Tayven Pappan, please visit our Tribute Store. "Email Address" would like to share the life celebration of Tayven Pappan. Click on the "link" to go to share a favorite memory or leave a condolence message for the family.